Quantum Door Services has solutions for all your door improvement projects and can provide a quick and economical solution for you. From cutting a new opening in your building to replacing a damaged door or frame call today for a free estimate! These hydraulic closers have a limited life span and fail sooner in high use areas. This can be easily identified by slamming doors or clear fluid leaking above the door, on the frame or floor. Our Service Trucks stock most common closers for immediate same day repairs. Older doors have hardware that is not available, cost prohibitive or simply isn’t good quality. Continuous Hinges are used more commonly these days because of the many retro-fit options that are available. These extremely durable, long-life hinges make once problematic doors literally a thing of the past. Our state of the art service trucks come stocked with most standard locks and repair parts for immediate same day repairs along with the ability to re-key locks as well. With today’s creative hardware options and our many years of expertise there is no need to replace that existing door. We can find a solution to any door egress code compliance or fire code problems. We can also make repairs to existing panic exit hardware as we have the ability to work on all types. We have fast access to replacement parts and hardware to insure your doors are working properly and safely fast! There are many fire rated doors, frames and window options available for those areas where fire code compliance is needed. 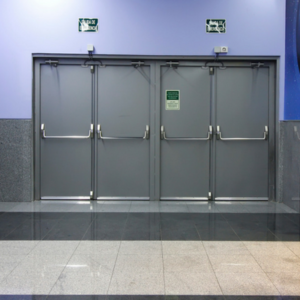 Quantum Doors can install new door openings in your existing concrete, block or steel walls and provide the needed fire rated doors for these code compliant fire rated openings. Stop these rodents and insects from compromising your business. We have solutions to these pest problems for your doors and frame openings. From in-swinging doors to out-swinging doors or revolving doors, Quantum has a solution to that cold draft or perhaps the construction or road noise disturbing your staff and customers. Some doors just seem out of place or dangerous and relocating them is impractical or cost prohibitive. A cost effective and simple solution is to install a new window in your existing door! We have fire rated glass for fire doors too! Have an architectural need for a custom door? Perhaps you have a storage room where chemicals are stored corrode your doors. There are Fiberglass and Stainless steel options for most environments. Clean room environments, manufacturing and storage. Quantum Doors can find a solution for you. From simple parts lubrication and cleaning to having each doors’ hardware re-secured, all moving parts lubricated and the needed hardware adjustments to insure long-term safe and proper operation. We have a program that will be tailored to your needs to insure the best, long-term operation of your doors. Saving a lot of time and money is our goal with this important maintenance program.